Lincoln Black Label in the land of the $100K SUV. 2018 Lincoln Navigator Black Label. The Lincoln brand is one in transition, a luxury marque that once outsold the likes of Cadillac, BMW, Mercedes-Benz and Lexus. But that was 1998 and the segment was far different from what it is today, with more brands competing than ever and seven of those now outselling Lincoln year after year. Lincoln may never again regain its segment leadership, but that’s probably not a priority for the Ford Motor Company. Instead, the “Lincoln Motor Company” is in the midst of a makeover, one that seeks greater differentiation between mainstream Ford and upscale Lincoln products. The hope here is for a new generation of Lincoln buyers, customers who like an unabashedly American brand and naming convention, and aren’t hung up on an alphanumeric nomenclature. Enter the 2018 Lincoln Navigator, the latest example of what this now century-old marque has to offer. Yes, it is built on Ford’s F-Series truck architecture and shares its platform with the Ford Expedition. But the differentiation is apparent on the outside and even more so once you open the doors and take a look around inside. Lincoln offers the 2018 Navigator with standard and extended wheelbases, along with rear-wheel drive (2WD) and four-wheel drive (4WD) models. It begins with the Premiere trim ($72,055), followed by Select ($76,055), Reserve ($81,025) and Black Label ($93,705). Lincoln offers the Premiere in the standard wheelbase guise only. Add $2,655 for four-wheel drive and $4,675 for the extended wheelbase. Select and Reserve models offer the most configuration choices, i.e. standard or extended wheelbases, two- or four-wheel drive. The Black Label edition is four-wheel drive only, but you still have a choice between standard and extended wheelbases. I was considering presenting a breakdown of the various packages offered, but then I realized it would only complicate matters. Luxury manufacturers, including Lincoln, routinely offer several packages as well as individual updates to the paint, wheels and so on. Quite frankly, the list is too involved to cover here. Here’s the thing: you’ll probably pay at least $80,000 to acquire the 2018 Navigator once your layout and package options are considered. Right off, you’re considering a model that’s in the same league as the Cadillac Escalade, Lexus LX570, Land Rover Range Rover and Mercedes GLS. If your budget can’t sustain this high cost, then consider the Ford Expedition. My test model was the 2018 Lincoln Navigator Black Label edition. That said, Black Label isn’t just a trim, rather it also encompasses concierge and other special services. What this means is when you choose a Black Label model, a whole host of services are included. For instance, if you live within 30 miles of a Lincoln showroom in most states, participating dealers will bring your new Navigator to you. Further, this suite includes unlimited car washes at the dealership, annual detailing, maintenance pickup and delivery, as well as travel and culinary advantages. The idea here is not just to provide an elevated level of elegance with the SUV, but the services to go with it. All this comes at a cost, of course. Interestingly, Lincoln shoppers are proving that they’re willing to pay for it. Indeed, as I researched this model I discovered that 85 percent of Navigator buyers are opting for the two top trims. Further, demand is so strong that dealer supply isn’t keeping up with demand. As a result, Ford has increased production of both the Navigator and the Expedition. How do you take an otherwise slab-sided SUV and imbue it with elegance? In the case of the 2018 Navigator you carefully rework the sheet metal to supply just the right among of ornamentation and pizzazz without appearing overwrought. Lincoln succeeded in this endeavor by imbuing the front fascia with a large honeycomb grille and distinctive lights. On closer inspection the grille pattern matches the Lincoln emblem for an altogether handsome look. Notably, when this key fob is in your hand, this SUV offers a series of approach features, including deploying running boards and numerous lights, including the door handles, mirror puddle lamps, front and back LED lights and the emblem itself. This makes for a stunning show, while also delivering an extra measure of safety. Lincoln’s choice of colors was carefully thought out, although depending on your choice, you’ll pay extra for it. For example, the Chrome Crystal Blue metallic paint on my test model and the Chroma Molten Gold also available are a $1,750 upgrade. That’s one of the few extras on the Black Label that may ultimately push your final price above $100,000. One of the significant touches on the 2018 Navigator are its 22-inch, 21-spoke ultra-bright machined wheels with ebony black painted pockets. The design was first applied to the Continental and is now found on the Black Label. On this big SUV, the look executes quite well. Other Black Label exterior features include automatic headlamps, bright belt molding, a luggage rack, panoramic vista roof and dual exhaust tips. Tow hooks are included with the four-wheel drive models. Where the Navigator’s exterior serves as the bait, the interior is this SUV’s hook. Here, Lincoln supplies a seven-seat layout with not an uncomfortable seat to be found. This SUV seems like a rolling living room and serves in that capacity too with its reclining second-row captains chairs, numerous drink holders, ambient light, reading lights and local climate control switches. The dashboard is nothing like a Ford truck nor is it like anything else Lincoln has applied to an SUV previously. The full force of Black Label elegance is released here with three design theme choices available: Chalet, Destination and Yacht Club. My test model had the last one, which incorporated beautiful blue leather surfaces, beige lacquered wood and aluminum trim. Lincoln paid special attention to each surface, nook and cranny to deliver an incomparable level of luxury or at least not comparable to anything the company has produced previously. The front seats are wide, supportive and amazingly comfortable. The requisite seat extender is there as well as heating, cooling and available massaging features. That last category is actually a $1,250 upgrade that brings in upgraded seats with 30-way adjustment and massaging from your shoulders down to the back of your knees. Navigator bigness is accompanied by an equally large instrument panel and color displays. 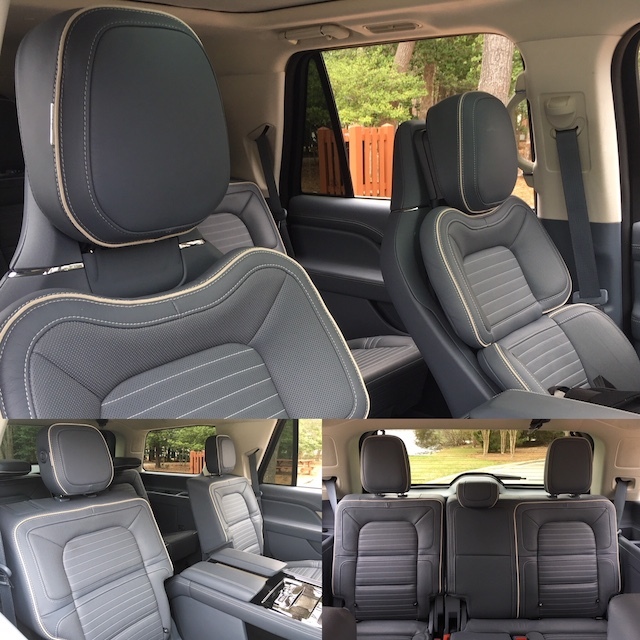 The finer details of the cabin give this SUV its styling points, from the look and layout of the center console to the feel of the door handles and to every switch, knob and button. As before, Lincoln places the transmission controls on the dashboard. This time, you’ll find a horizontal layout with switches, replacing the previous vertical design with buttons. I’m not sure why I think the new arrangement is better, but it seems natural. It also allows for a floating console design with ample storage room and hidden recesses underneath. Lincoln wasted nothing with the 2018 Navigator, ensuring each touchpoint has its own design. Generations ago, cabin speakers were ugly, intrusive and seemingly out of place. Even in recent years, they often seemed like an odd match in some cabins. But not in the new Lincoln Navigator as each speaker is artistically designed and enhances the overall look. 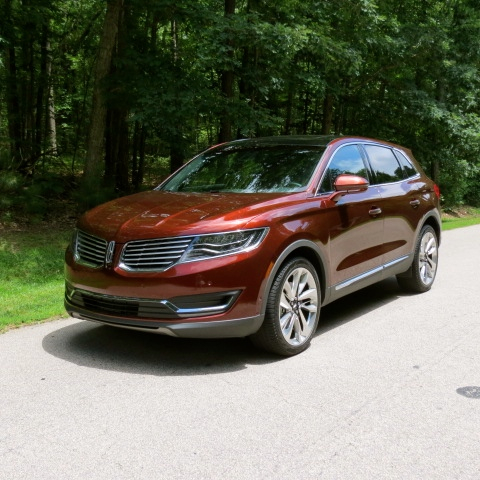 The Lincoln’s bigness is one of this model’s strongest safety points. If you’re in an accident, you have three tons of mass to ease the blow. Lincoln also includes a full suite of safety equipment, including a head-up display, adaptive cruise control with full stop, a pre-collision system with pedestrian detection, blind spot warning, lane keep assist and a 360-degree camera. It doesn’t include autonomous driving features yet, but it does provide active park assist. The Lincoln SYNC 3 telematics interface is a much-needed improvement on the previous model. Here, Lincoln supplies a 10-inch color display that seems bolted on to the center console. I like the look, especially its sturdy feel. The system provides numerous features, including Siri Eyes Free, smartphone integration, voice-activated navigation and WiFi. You can connect up to 10 devices at a time and surf the web to your heart’s content. The 20-speaker Revel II audio package delivers concert-hall sound throughout the cabin. Other tech features include six USB ports, including two in the second row, a 110-volt outlet and a wireless device charging pad. We haven’t seen a V8 engine in the Lincoln Navigator in several years as a twin-turbo V6 moves this big SUV. For 2018, the 3.5-liter V6 engine is updated, outfitted with new aluminum heads, a composite oil sump, BorgWarner turbos and a new port fuel injection systems, among other improvements. The result is a much more powerful engine delivering an astounding 450 horsepower and 510 pound-feet of torque. That’s easily the most powerful engine Ford offers, outstripping the power from its naturally aspirated 6.2-liter V8 engine. The transmission is new too, a 10-speed automatic that syncs well with the new engine. The 2018 Navigator delivers more than sufficient power with very good off-the-mark acceleration along with explosive performance when you need it, such as when entering a highway or passing traffic on that same road. Steering is weighty and handling is exactly what you expect with a three-ton, 18.5-foot-long SUV. There was one surprise with the Navigator I hadn’t expected. Although the ride is comfortable, I noticed a slight amount of residual bounce over the rear axle when passing over uneven surfaces such as my neighborhood’s speed bumps. Just one week earlier, I had the Chevrolet Suburban and that bouncing sensation was absent when traveling down the same road. The Navigator features an independent rear suspension, while GM’s big SUVs utilize a live rear axle suspension. The 2018 Navigator is a much more dramatic change for the Lincoln moniker than the new Continental was. Not simply because people are more apt buy a large SUV than a big sedan, but for the design upgrade the Navigator represents. Buyers will likely begin their search with the Select trim and go from there. What’s hard to avoid are the amenities found with the two top trims, especially with the Black Label itself. Clearly, the new Navigator out-pimps the current Cadillac Escalade, matches well with Range Rover and I’ve been told that it makes a run for the Bentley Bentayga costing twice as much, although I haven’t seen it. All in all, the 2018 Lincoln Navigator offers a clean departure from the previous model, while bringing the brand into new territory. While the Black Label trim itself executes well, the concierge services may be a determining factor whether the Lincoln marque has everything luxury shoppers expect. Lincoln Navigator Black Label photos copyright Auto Trends Magazine. All rights reserved. Pickup and delivery service goes brand-wide for 2017. The Ford Motor Company’s Lincoln brand is exploring new ways to win over customers. This week, Lincoln announced plans to turn its experimental trial pickup and delivery service program into a permanent effort, effectively expanding its current concierge services. The Lincoln Service Valet rolls out across all 2017 nameplates, beginning with the all-new Lincoln Continental arriving this summer. 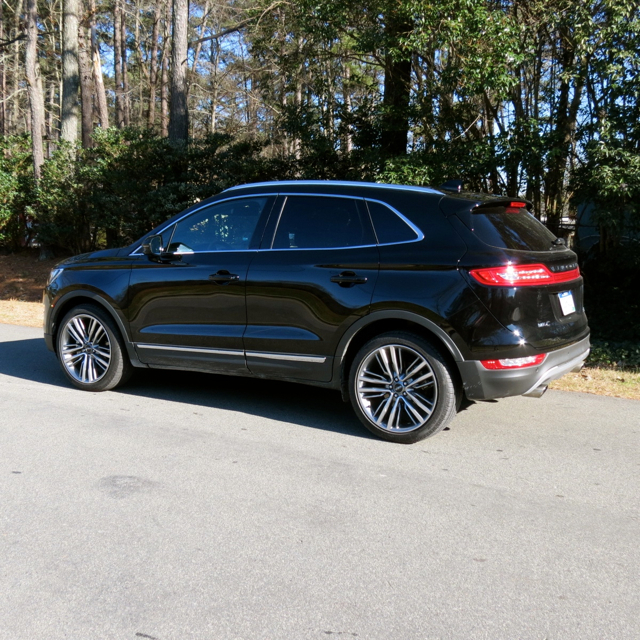 According to the manufacturer, the Lincoln Service Valet will pick up a client’s vehicle at a mutually agreed upon location, supplying a complimentary Lincoln loaner vehicle while the client’s vehicle is being serviced at the dealership. Upon completion of the service, Lincoln owners can arrange for their washed and serviced vehicle to be returned to them at the location of their choice. The loaner vehicle is then returned to the dealer. Lincoln began its pilot program in May 2015, choosing a select group of dealers to fine-tune the project. The manufacturer claims an overwhelmingly positive experience based on customer reactions. Specifically, 98 percent of the clients indicated they would be more likely to receive services from that Lincoln dealer in the future. Another 98 percent said they would recommend Lincoln and the service to a friend. Importantly, 93 percent said they are likely to purchase another Lincoln vehicle. These are the numbers any luxury brand would aspire to. The latest concierge service initiative comes from a business plan adopted in 2012 to merge product offerings, provide a peerless service, and to supply a superior experience for brand customers. It will be added to an existing line of services to extend the original initiative. That initiative is composed of multiple programs, including Lincoln Concierge, Black Label, Date Night, and the Lincoln Institute. Lincoln Concierge provides customers with a personal advisor, available to assist customers around the clock. Although other luxury brands offer this service, Lincoln extends the service further by providing a video chat function. The Black Label service, launched in 2015, involves more than 90 participating dealers. The service provides personalized shopping by helping customers identify their vehicle by providing paint and wood samples in their home or other location. Special privileges are also included such as maintenance coverage on wear items. Other services include “date night” whereby participating dealers provide extended test drives for up to 48 hours. Lincoln says the program resulted in an 11 percent increase in sales. Some 70 percent of clients came from other luxury brands. As for the Lincoln Institute, it provides hospitality training for brand dealers and includes a series of workshops to help Lincoln teams to improve their processes with luxury clients. Lincoln’s US sales are up 14.7 percent in a market that is up just 1.1 percent. Importantly, Lincoln is ahead of many of its competitors, including arch-rival Cadillac. Indeed, Cadillac sales are down 12.5 percent through May 2016. Further, among the premium brands, only Volvo (up 20 percent) and Jaguar (up 24.6 percent) are outpacing Ford’s luxury marque. That means a revived Lincoln — is outpacing such industry stalwarts as Lexus, Mercedes-Benz, Acura, BMW, Land Rover, and Audi. Lincoln currently occupies ninth place among luxury automotive brands. In 1998, Lincoln outpaced all comers, but its sales fell dramatically over the next 15 years. Photos copyright Auto Trends Magazine.